Welcome to Day 3 of our holiday releases for October! 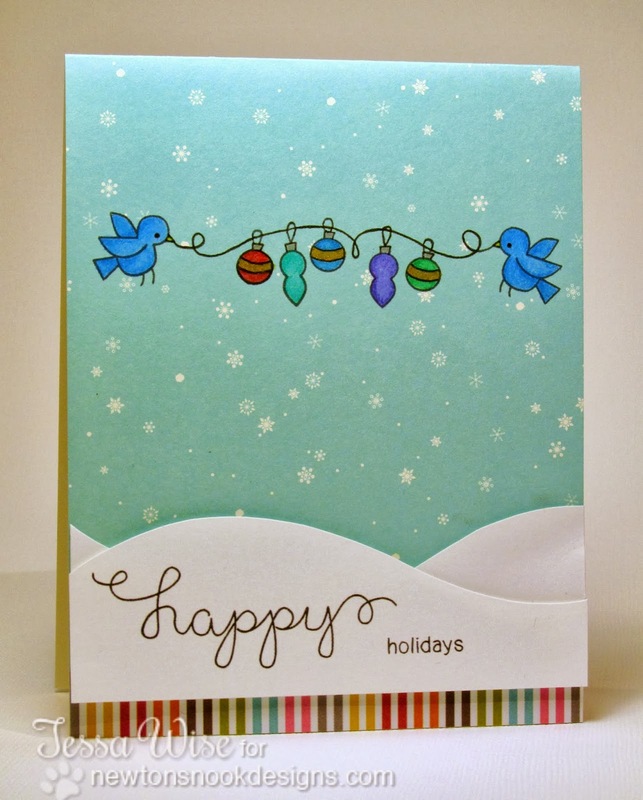 Today we are featuring the set Holiday Wishes! We are giving this set away to two lucky winners so make sure you read all the way to the bottom of this posting to see how to win! 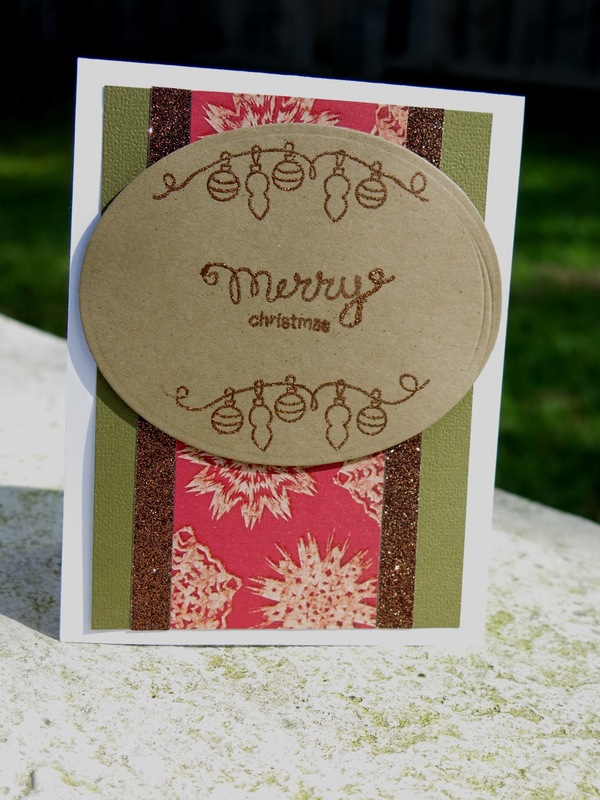 This set is perfect for all your Holiday Greetings! 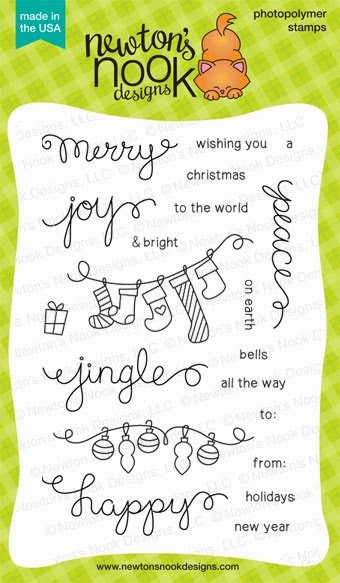 You can combine all the words in the set to customize your holiday messages - plus there's even a happy new year! Use it out as on gift tags too and envelopes too! 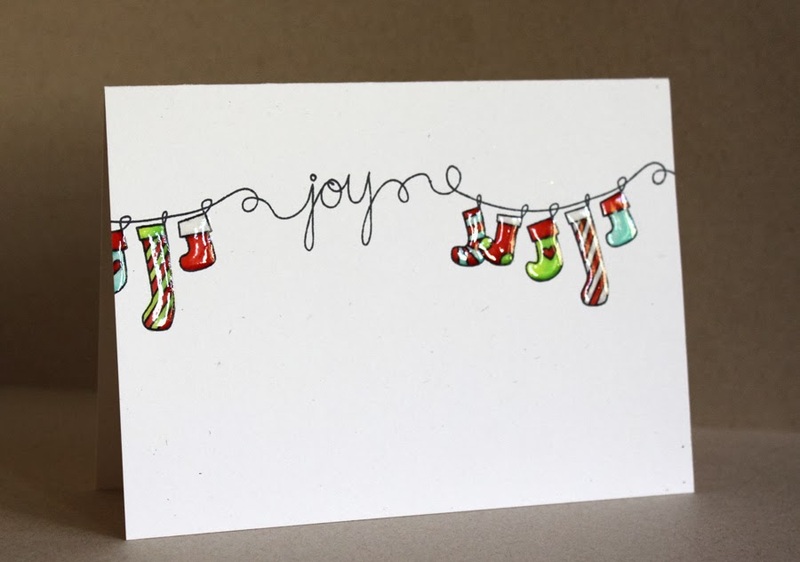 Our October Guest Designer, Alice Wertz, combined the stockings and the "joy" stamps from this set to create this simple and sweet Holiday card! I love the gloss she added onto the stockings! Our October Guest Designer, Danielle Pandeline created this simple holiday card with the ornaments and the "merry" and "christmas" stamps! Love the metallic gold use used! Tessa Wise created this adorable card - She combined the images from this new set with the birdies from the Winged Wishes set! Isn't it cool how nicely they coordinate? 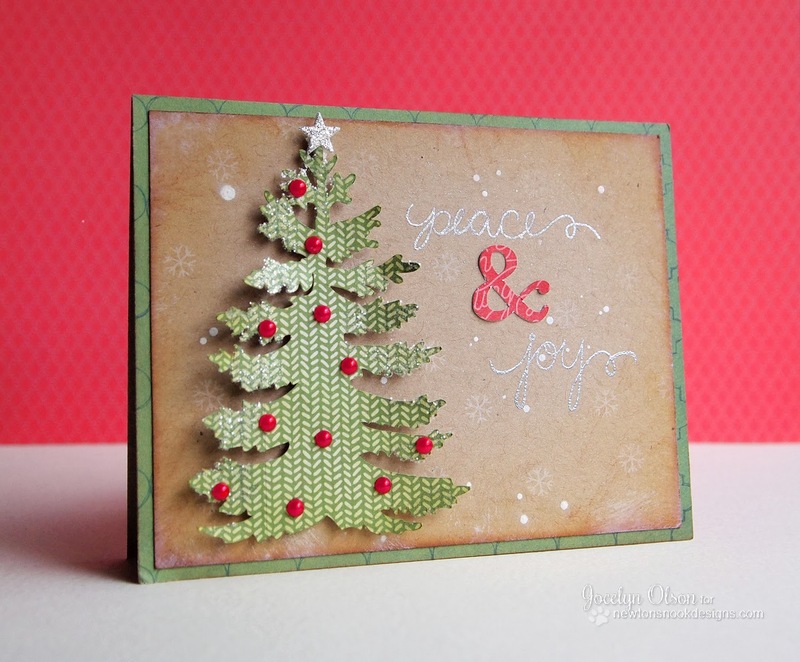 This card by Jocelyn Olson uses the words peace and joy from this set! I love how she combined them with a lovely christmas tree! 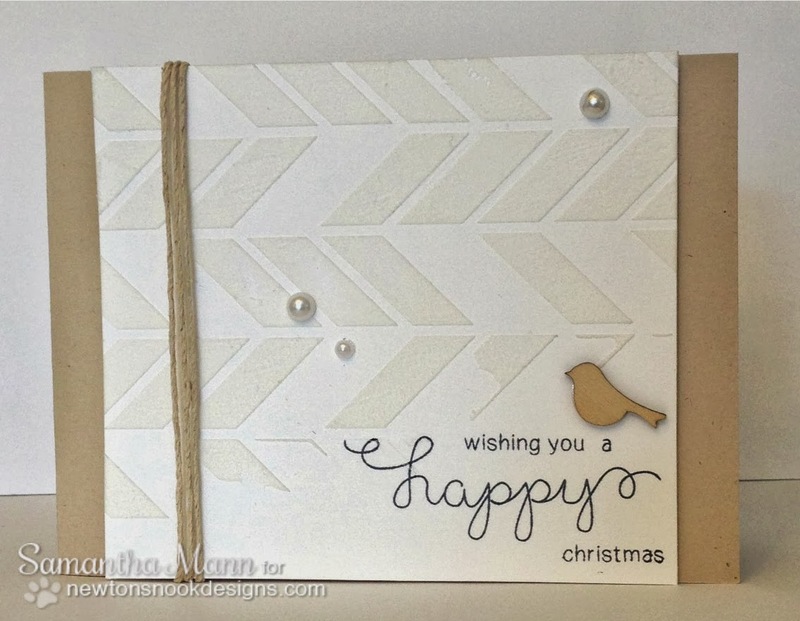 Samantha Mann made this monochromatic card using just tones of white and kraft. Isn't it lovely? It's so pretty! Check out her blog today for another cute card using this set! Jennifer Ingle created this fun card using "jingle" and "all the way" - Since her nickname is "Jingle," I think that was an appropriate choice! Would you like to win Holiday Wishes? Don't forget to come back tomorrow and see and enter to win our last release, SEAson's Greetings! Awesome set! Love the possibilities of this! Very cute! I really love the stockings! I found your stamps because of following Alice's Little Wonderland blog. I so can't wait til Friday to order the Newton's Holiday Mischief stamps (and the three other sets that I've decided I must have). So cute!!! BEAUTIFUL creations from your talented team, as always! I really like these scripty sentiments - I keep thinking how awesome they'd look with hand-stitching over them... ;) Loving all the sneak peeks! Oh....love the scripty, loopy font! These cards are gorgeous! I have the little birds. Now I need the Christmas sentiments. Great hop. 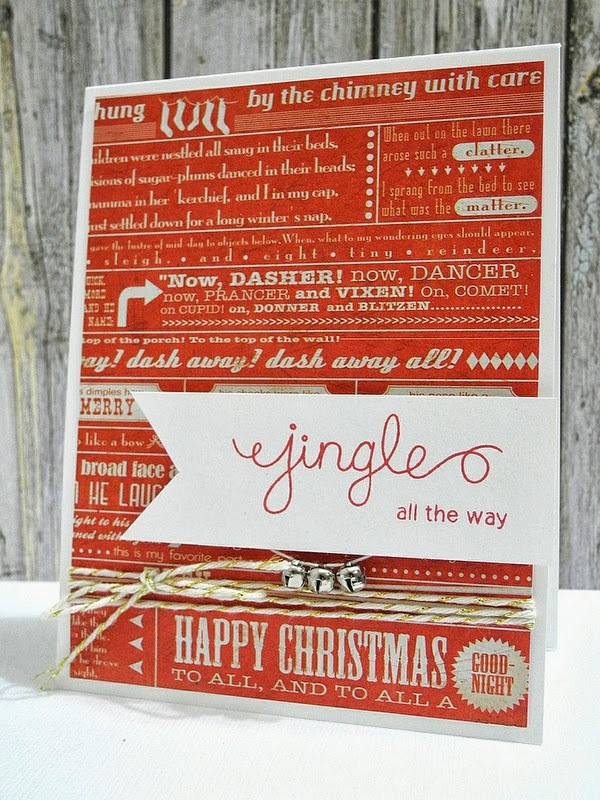 A delightful string of ornaments, Christmas sentiments, loopy letter and the single darling present: what's not to love? Charming, cute and wonderful! LOVE this set!! wonderful sentiments and love the font. lovely cards today I love each one of them...thanks for sharing them with us. What a super fun set! Love how the words work with the hanging ornaments and stockings! The DT projects are also fab! So cute! I love how versatile this set is! So many possibilities! oh love the flawy curly-q style print of the sentiments and the precious stockings! Nothing more exciting than a new stamp company. Your designs look AMAZING so far. Yayyyy! This looks like a really versatile and fun set! Very sweet set! I love the sample cards.... lots of great ideas! What a super fun set this is!Love it! What a lovely set...and I love the first card! You had me at Merry :) sweetness!!! Those loopy greetings are very creative--lots of options for linking them with other images, etc. Great variety of cards by the DT! Fabulous set! Love the flowy font stamps. Great set for CAS cards! Love these too. All the sets are wonderful! Very cute stamp set. The cards are great. What a super cute set! Love all of the curly q's and those adorable whimsical images!! !